Most of the action takes place on the streets of New York City, following a young college student, Chloe, as she searches for her missing brother and mother, and in an airliner bound for London, which follows Chloe’s father, the plane’s pilot, as he deals with emotional and mechanical problems that result from the rapture. The film moves forward on the twin tracks of the characters’ coming to the realization of the cause of the bizarre disappearances and the stressful need to land the crippled and quickly defueling airliner. I’ll let others talk about the merits of the film as a film, but I’d like to address the film’s approach to the precipitating event of the action, the rapture. The rapture is a doctrine taught especially in Paul’s first letter to the Thessalonians, chapter 4 and verses 15-17. There, Paul teaches that at the return of Christ, all believers will be caught up (i.e., “raptured”) to meet the Lord in the air. The bodies of dead believers will be resurrected, and, according to 1 Cor 15:51-55, all believers, living and dead, will be glorified. The timing of this event is debated among biblical scholars, and Left Behind presents a scenario based on one interpretation of that timing, an interpretation known as pretribulationism. Pretribulationists understand the Bible (especially the books of Daniel, 2 Thessalonians, and Revelation) to predict the rule of a satanically inspired world dictator, commonly known as the Antichrist, for the final seven years of this age — a time pretribulationists refer to as “the tribulation.” This dictator will deceive the population of earth into worshipping him and will severely persecute those who don’t. The worship of this dictator will center on a statue he will erect in the newly-built Jewish temple in Jerusalem, what the Bible calls the “abomination of desolation” and which he will set up three and one-half years into his rule. Pretribulationism teaches that believers will be “raptured” before the beginning of this period of Antichrist rule, that is, before the tribulation. Those who are “left behind” will face the decision to worship the Antichrist (and eventually face damnation) or to turn to the true God and face a more immediate intense persecution and death. There are two other interpretations of the biblical data that differ from pretribulationism. The prewrath view accepts the basic scenario of the rise of Antichrist taught by pretribulationism, but understands Jesus in Matthew 24, Paul in 2 Thessalonians 2, and John in Revelation to teach that the church will experience the persecution of Antichrist that follows the establishment of the abomination of desolation. It will be raptured during this period of persecution, immediately before God begins to pour out his wrathful judgments on the kingdom of Antichrist. The second view, posttribulationism, comes in two different flavors. Some posttribulationists reject altogether the idea of an Antichrist arising at the end of time and instead understand the Bible to be referring to events in the first century AD when it talks about the abomination of desolation. Since those days, the church has been living in an age of tribulation; there is no essentially different persecution to come in the future. Others accept the basic scenario of a future Antichrist but see no biblical evidence that the church will be “raptured” before or during the Antichrist’s reign and persecution. Rather, in both versions of posttribulationism, the church will be raptured in conjunction with the return of Christ to earth at the very end of the age, after either this age of tribulation or after the specific tribulation brought about by Antichrist at the end of the age. 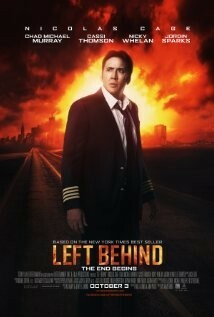 Thus, the scenario presented in Left Behind is not a scenario all biblical scholars would agree with. The film, in my opinion, presents a plausible reflection of the sorts of things one might expect given a pretribulational rapture, but it is only one possible reading of the biblical evidence and its implications. Certainly, given a pretribulation rapture, a person would not want to be one of those “left behind,” and, as the film implies, that may be a powerful incentive to turn to Christ before it’s too late! But, of course, it doesn’t take pretribulationism to provide this powerful incentive. On the one hand, anyone who turns to Christ during this age will potentially face persecution (John 15:20; 16:33), and many have faced and still do face incredibly severe persecution (and with courage supplied by their Lord), so that the option of avoiding Antichrist’s persecution does not seem any great incentive for repentance. On the other hand, regardless of how the tribulation and rapture works out, a greater incentive to turn to Christ now is rather to avoid the inevitable judgment of God that all sides agree is the ultimate outcome of unbelief (Matt 10:28). This is not even to mention, of course, the numerous positive reasons to submit to Christ now as well, not the least being the hope, joy, and strength he provides to those who are his as they live for him in this world. Perhaps, in the end, these are good reasons not only to go and see Left Behind, but to take a friend who doesn’t know Christ. The film may not be based on the best reading of the biblical evidence or present the best reason to turn to Christ, but it will certainly open opportunities to talk about the big issues, and especially where we want to be on the final day. See here for further discussion on the timing of the rapture.